Among adults with membranous nephropathy, about 3%–5% have autoantibodies directed against thrombospondin type 1 domain–containing 7A (THSD7A), a podocyte-expressed transmembrane protein. To better understand the effects of THSD7A autoantibodies in this disease, the authors investigated THSD7A’s temporal expression, spatial expression, and biological function in podocytes. They found that embryonic THSD7A expression begins on glomerular vascularization and slit diaphragm formation and that THSD7A and THSD7A autoantibodies localize to the slit diaphragm domain of foot processes. Expression of THSD7A in cultured human podocytes was associated with enhanced adhesion and decreased ability to migrate, suggesting that THSD7A may be involved in stabilizing the slit diaphragm and that autoantibodies to THSD7A might structurally and functionally alter the slit diaphragm’s permeability to protein. Background About 3%–5% of adults with membranous nephropathy have autoantibodies directed against thrombospondin type 1 domain–containing 7A (THSD7A), a podocyte-expressed transmembrane protein. However, the temporal and spatial expression of THSD7A and its biologic function for podocytes are unknown, information that is needed to understand the effects of THSD7A autoantibodies in this disease. Methods Using a variety of microscopic techniques, we analyzed THSD7A localization in postnatal, adult, and autoantibody-injected mice as well as in human podocytes. We also analyzed THSD7A function in human podocytes using confocal microscopy; Western blotting; and adhesion and migration assays. Results We found that THSD7A expression begins on glomerular vascularization with slit diaphragm formation in development. THSD7A localizes to the basal aspect of foot processes, closely following the meanders of the slit diaphragm in human and mice. Autoantibodies binding to THSD7A localize to the slit diaphragm. In human podocytes, THSD7A expression is accentuated at filopodia and thin arborized protrusions, an expression pattern associated with decreased membrane activity of cytoskeletal regulators. We also found that, phenotypically, THSD7A expression in human podocytes is associated not only with increases in cell size, enhanced adhesion, and reduced detachment from collagen type IV–coated plates but also, with decreased ability to migrate. 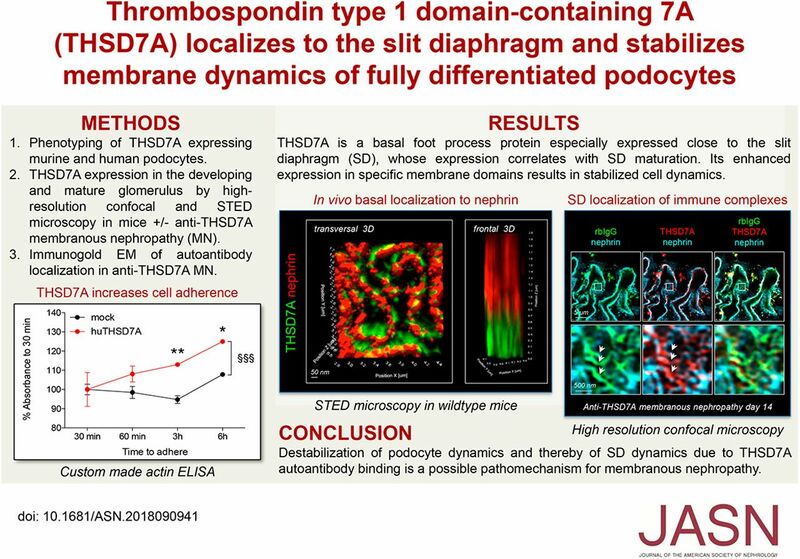 Conclusions Our findings suggest that THSD7A functions as a foot process protein involved in the stabilization of the slit diaphragm of mature podocytes and that autoantibodies to THSD7A, on the basis of their localization, might structurally and functionally alter the slit diaphragm’s permeability to protein.